Library Associate Angela Harper reads "Yo! Yes?" at a visit to Tully Elementary. 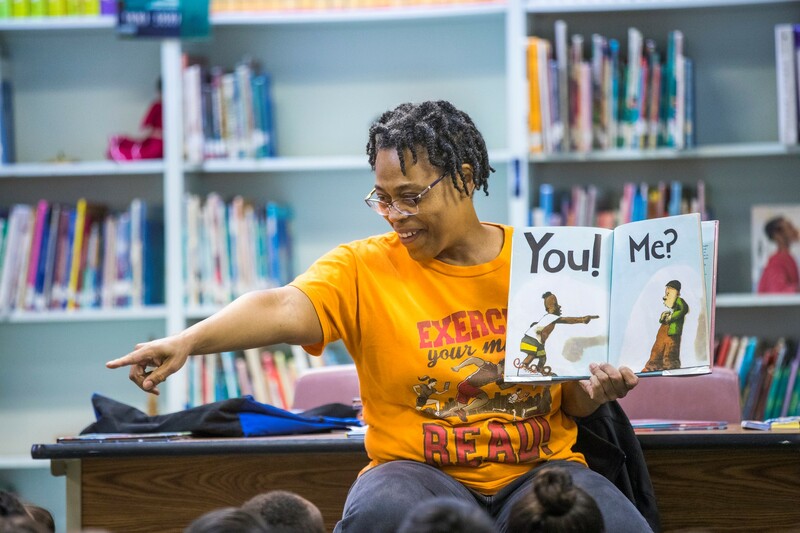 When they see El Rio Library staff member Angela in her bright orange shirt that says “Exercise your mind… READ!” the students know they’re in for fun. It’s the African American Read In, coordinated by Tucson Unified School District’s African American Student Services, at Tully Elementary School. More than three dozen kindergartners sit on a bright green reading rug waiting for the special Storytime to begin. She pulls out a copy of Crown: An Ode to the Fresh Cut. It tells the story of a black boy at a barbershop. The book received rave reviews when it debuted, including “A not-to-be-missed portrayal of the beauty of black boyhood” (The Horn Book Guide). Turning to the first page, she smiles, “We’re going to the barbershop with this one.” A student calls out, “Miss Angela, what’s an ode?” Already, the story has the kids thinking, asking questions, and learning. After finishing the third book—why am I me?—Angela says, “Today I’m going to give you all a book.” Cheers fill the room. “There are plenty to choose from,” she says. “We’ve got one about a sailor; this one’s about a poet. Have you ever heard of the Hallelujah Flight? We’ve got that, too.” Many of the books are bilingual; the characters are people of color. All of them were carefully selected. Angela shouts, “Raise your hand if you had fun today.” Unsurprisingly, everyone raises their hands. Last year, Library staff made more than 240 visits to local schools, reaching nearly 13,000 students!